Excerpt from “Members of Hotel Association of New York City, Rates per Day,”ca 1940, in the Collection on Dining and Hospitality. Museum of the City of New York. The holidays are prime tourist season in New York City – we’re coming up on the Macy’s Thanksgiving Day Parade next week, department stores are mounting their holiday window displays, and the ice skating rink is open at Rockefeller Center. 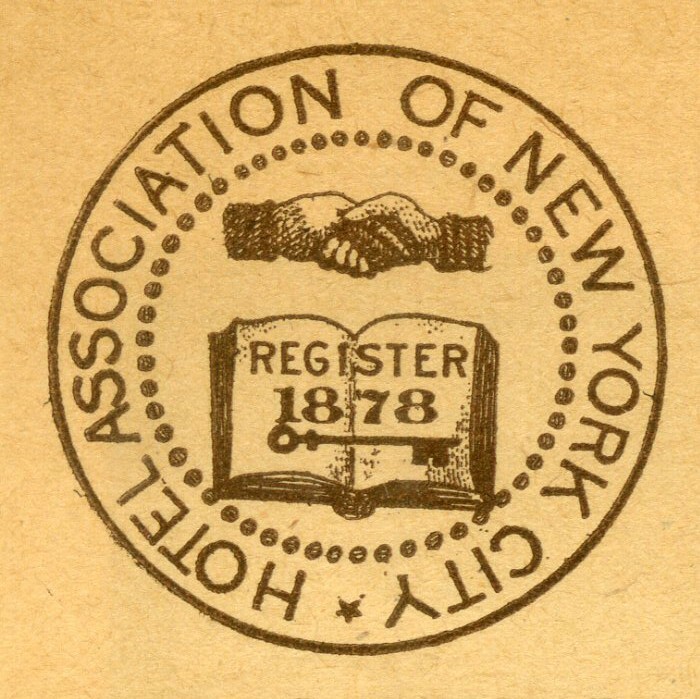 As we have continued to prepare the Museum’s ephemera collections for digitization as part of a National Endowment for the Humanities grant, we’ve been able to take a closer look at some the hotels that have housed the throngs of tourists that flock to New York City, not just at the holidays but year round. The following selections from the Collection on Dining and Hospitality are just a small sampling of what will be available in the coming months via the Museum’s online Collections Portal as part of this project. One hotel that immediately caught our eye was the Hotel Shelburne, or rather, the yet to be realized Hotel Shelburne II. The Hotel Shelburne is still in operation at Lexington Avenue at 37th Street, but in the early 1960s they had a much grander vision of their future. The Shelburne II was scheduled to open on the moon by 1971. Hotel Shelburne (recto and verso views), ca. 1961, in the Collection on Dining and Hospitality. Museum of the City of New York. 94.41.2. If you read the guarantee on the verso of the promotional card above (right side of image), you’ll see that anyone bearing this card is entitled to a free weekend stay at the hotel, since the moon outpost wasn’t completed by 1971. Anyone want to give it a try? As is to be expected, the collection holds several pieces of ephemera for the city’s more well known hotels, such as the Waldorf-Astoria. The Waldorf-Astoria produced an entire promotional booklet titled “Behind the Scenes at the Waldorf-Astoria,” featuring profiles of staff and a look inside the kitchens, housekeeping, the”furniture hospital,” and the domain of the “key man.” The booklet was donated to the Museum by Victor R. Ruiz, in honor of his mother, who worked in the hotel’s beauty salon for several years. 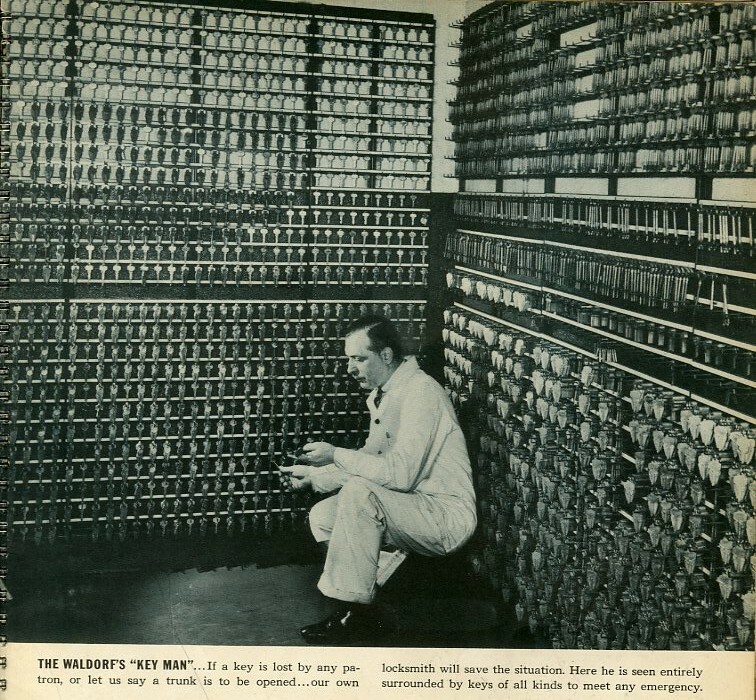 Excerpt from “Behind the Scenes at the Waldorf-Astoria,” ca. 1940, in the Collection on Dining and Hospitality. Museum of the City of New York. F2014.18.37. 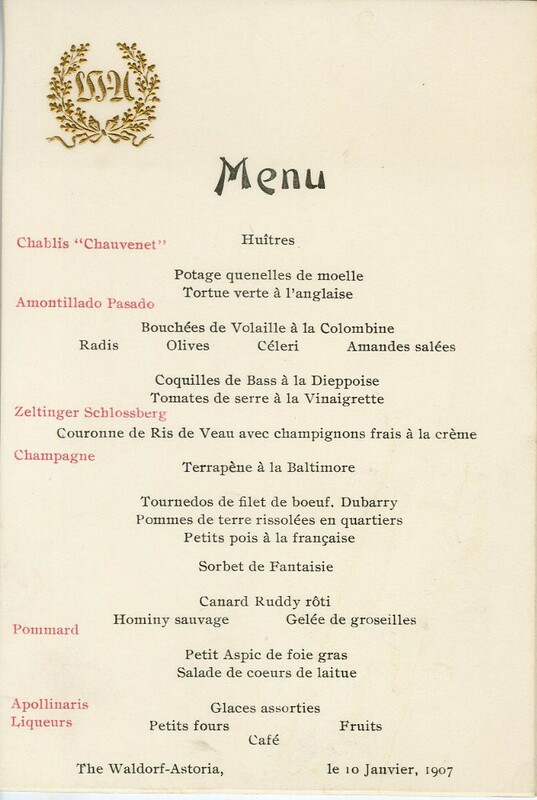 Waldorf-Astoria menu, 1907, in the Collection on Dining and Hospitality. Museum of the City of New York. 42.250.62. The Colonnades, Essex House, ca 1937, in the Collection on Dining and Hospitality. Museum of the City of New York. 2003.50.2. One of the most common objects in the Collection on Dining and Hospitality is the menu. These vary from day-to-day dinner menus, such as the one pictured to the right for the Waldorf- Astoria, to those for special events such as the one for the Essex House, pictured below. The Essex House opened in 1931 on 59th Street; its iconic roof sign is still visible today. 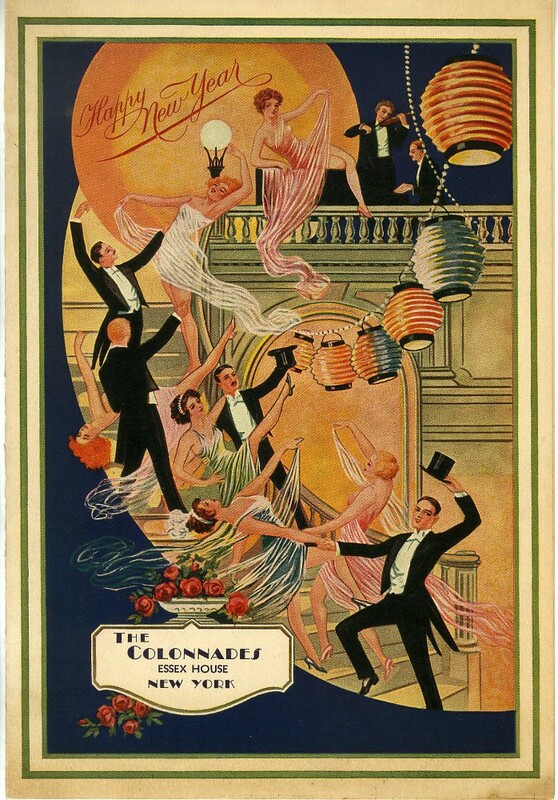 I wonder if New Year’s Eve of 2015 will compare with the the festivities pictured on the cover of this menu from the 1930s. One of the oldest pieces of hotel ephemera in the Museum’s collection is this piece of private scrip, or money, from Crook’s Hotel and Saloon, dating to 1852. The Hotel was located at 80 Chatham Street, now Park Row. Crook’s Hotel and Saloon, 1852, in the Collection on Dining and Hospitality. Museum of the City of New York. 39.526.2. This name of the establishment, “Crook’s Hotel and Saloon,” immediately brings to mind an image of a “wild west” period of New York City’s early history. Though actually named for it’s proprietor Samuel H. Crook, the hotel did in fact gain an element of notoriety when Crook committed suicide in his rooms at the hotel in 1890. Stay tuned for more selections from this and other ephemera collections here at the Museum. Next time we visit this collection, will take a look at where all of these people – tourists and New Yorkers alike – ate when they were in town. Love the blogs! Question: by any chance is that Essex poster available some place for purchase?? Or can I get a high resolution digitized image so I can reproduce it ( which would incur a R&R fee)? Susan, glad you like the blog! You can contact our Rights department for reproductions: rights@mcny.org. Lindsay, congrats on another wonderful blog post! I will strive to live up to 1937 standards this New Years Eve. I’m still sad there is no Hotel Shelburne on the moon! My wife and I made our first trip to NYC in Nov 2013 and walked in The Hotel Shelburne to present that guarantee card to the front desk. My father received it from a business associate back in the 60s and it has been a funny conversation piece in our family ever since. Despite my skepticism they confirmed the card was authentic but could not accept it for a free weekend stay. That is good to know, Ralph. We found a Shelburne Guarantee Card in my grandfather’s papers. I have carried it in my wallet for about 15 years on the off chance that, one day, I get kidnapped, taken to NYC, make an amazing escape, but then need to find a place to stay for the weekend. Found a Shelburne II card in my old dresser as I cleaned out the family home following my mother’s passing this year. Dad brought it back from an NYC stay in the early 60s. Still makes a good conversation piece! This entry was posted on November 17, 2014 by Lindsay Turley in Digital Project, Manuscripts and Ephemera and tagged Crook's Hotel and Saloon, Ephemera, Essex House, hospitality, Hotel Shelburne, Hotels, National Endowment for the Humanities, tourism, Waldorf-Astoria.